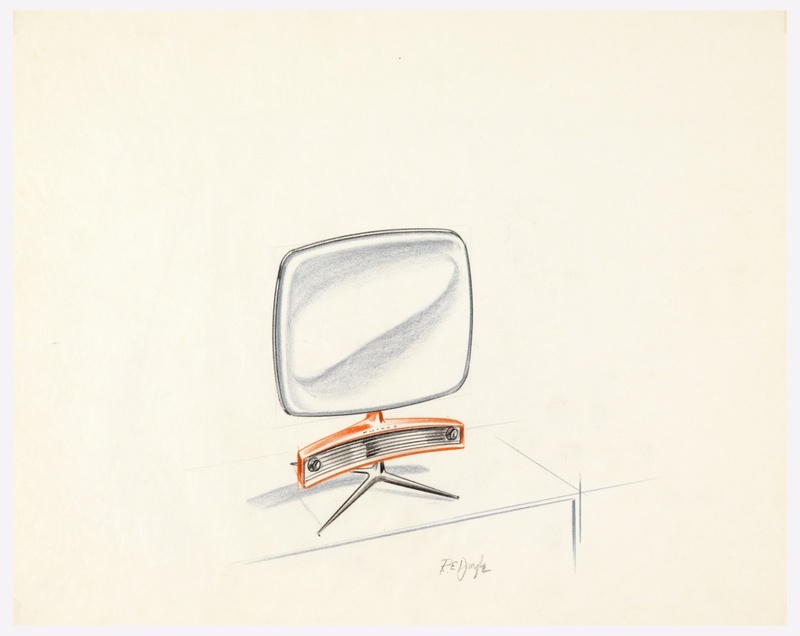 This concept sketch for the famed Philco Predicta television (1958–60), an example of which is in the museum’s collection, stands out for its red tuner that recalls the dashboard of a 1950s automobile. The design is the work of Robert E. Doyle, a member of the Predicta design team that was led by Herbert Gosweiler and Severin Jonassen. Doyle, a graduate of Pratt Institute in New York (1953), joined Philco in November 1957 after working for International Harvester, where he designed the 1957 Jubilee pickup truck. At Philco, Doyle designed radios, televisions, and kitchen products. In November 1962, he left Philco for Sylvania where he stayed for 20 years, eventually becoming head of design for their television division. In the early 1980s, he moved to Knoxville to work for Magnavox and later opened his own independent design firm. Predicta Television, 1959. Manufactured by Philco. Metal, glass, plastic. Gift of Jan Staller in honor of Max Staller, 2008-29-1. The evolution of the Predicta television was very much a team effort. While Jonassen, Richard Whipple, and Catherine Walker are credited with the design of several different Predicta models, there were many stages and players in the development of these televisions. The 1958–59 production models were not financially successful because they were ahead of the market stylistically and Doyle was assigned to design a more “mellow” version. Doyle’s concept never went into production and the whole Predicta project came to a halt in 1960. This sketch represents Doyle’s blue sky concept for the Predicta. According to the designer, he envisioned the television made of an injection molded tube housing, tuner, and base that was far ahead of the technology of the time. A photograph from the designer’s archives depicts Doyle and a colleague sitting in front of the sketch while Doyle holds the prototype mock-up for the plastic housing, indicating that the sketch provoked some kind of discourse in the design evolution of a Predicta model, regardless of whether or not it was ever produced.